Ever since Darci Faye was a little girl, she’s dreamed of becoming a playwright. Now that dream is happening in a very big way as the University of Maine at Presque Isle student prepares to see a show she wrote performed live on stage in New York City. This June and July, Faye’s play Infinitely Yours will get five performances at the Paradise Factory Theatre as part of the Planet Connections Theatre Festival. Faye, a senior Criminal Justice major and Caribou native, was thrilled when she learned this spring that Planet Connections had accepted her play into its summer lineup. Infinitely Yours is a drama that centers on domestic violence—it follows main characters Emily and Jason as they meet for the first time since a high school romance gone very sour. 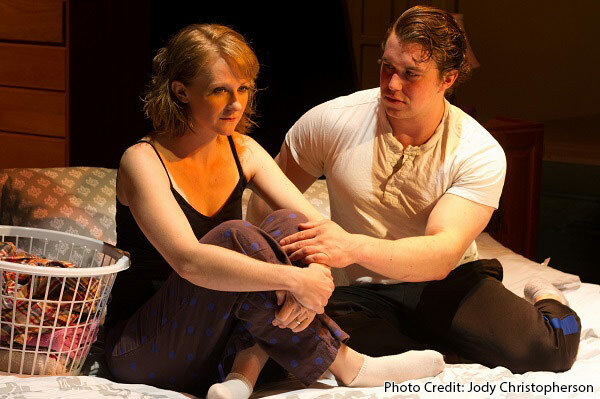 The play examines the ripples and waves one fateful meeting can have in a person’s life. Faye said she discovered her voice back in 2011, when she was studying at Stony Brook University on Long Island, New York, as part of UMPI’s National Student Exchange Program. Faye took an introduction to theater course and assisted in a production being led by her instructor. The work inspired her to write her own play. After she nailed down her second draft of Infinitely Yours, she held a reading with four actor friends. When one of them suggested that she go to graduate school for playwrighting, Faye’s path became clear. She spent two years at Primary Stages’ Einhorn School of Performing Arts, an off-Broadway theater company in New York City, taking playwrighting classes. While she didn’t receive credit or grades, she gained invaluable experience workshopping her material and getting feedback from working professionals. By 2014, Faye knew she’d honed her craft to a point where she needed to focus again on her Bachelor’s degree. Because she knew she wanted to focus her playwrighting on domestic violence and other criminal and social justice issues, she opted not to pursue an English degree, but to seek one in Criminal Justice. Since returning to campus, Faye has not only worked hard on her degree, she’s worked to create theater opportunities for campus and community members. She revived the University Players, the campus drama club; staged Infinitely Yours; hosted a playwrighting festival; and invited community members to take the stage as part of two Broadway Revues. Right now, though, Faye’s in a New York state of mind. With the first performance about a week away, she still has lots to organize. Faye has a Kickstarter campaign to help pay the actors, director and stage manager who are involved in the show. She needs to raise $800 by June 23 and has already raised about $500. To learn more or to make a donation, visit https://www.kickstarter.com/projects/561141411/planet-connections-presents-infinitely-yours. In addition, she’s partnered with the Hunker-Down INNitiative, which helps victims of domestic violence flee their unsafe homes with their pets. Proceeds from the NYC production will go toward this program. Faye’s show will be performed at the Paradise Factory Theatre, 64 East 4th St, on the following dates and times: Sunday, June 19 at 2 p.m.; Saturday, June 25 at 7 p.m.; Thursday, June 30 at 9 p.m.; Saturday, July 2 at 11:30 a.m.; and Tuesday, July 5, at 7 p.m. Tickets can be purchased at https://web.ovationtix.com/trs/cal/27385 or 1-866-811-4111. This is an approved Equity Showcase, directed by Aaron Vega and featuring the following actors: Deb Radloff*, Andrew Hutcheson*, Maria Tholl*, and Kevin Kiler*. *Denotes a member of the Actors Equity Association.